A good daily skincare regime is essential if you want to really invest in your skin and maintain and enhance the results of treatments. Dr Acquilla has selected some of the leading ranges on the market to offer our patients the best that science has to offer. These products go beyond cosmetics to give visible results. u which is both preventative and corrective. These clinically researched, results-driven skincare cosmeceuticals can make a real difference to the quality of your skin and the overall radiance of your complexion. 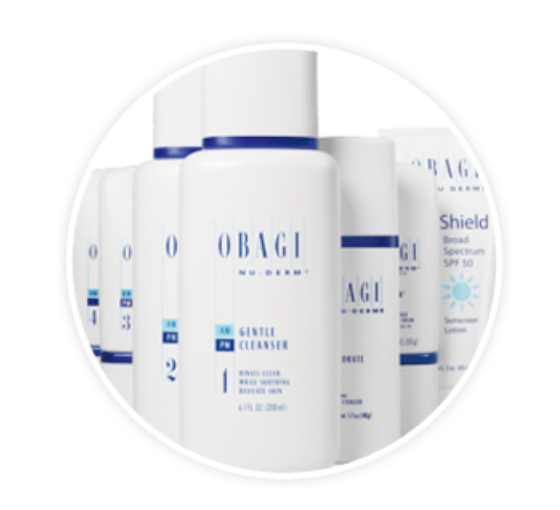 The Obagi Nu-Derm System is a prescription only skin care system, which accelerates skin cell turnover. The system penetrates deep to improve damage in all layers of the skin. It optimises functions of the skin at the cellular level to help it look and act younger and healthier. In this initial phase, the damaged top layer of skin is replaced by a new layer of fresh, healthy skin cells. Ongoing significant improvements in your skin as stimulation continues. During this phase, people will start to notice and comment that your skin looks younger and healthier. You have transformed your skin, which looks and functions healthier and younger. For more than 35 years Dr. Obagi has defined and continues to advance skincare to include the concept of creating and maintaining healthy skin as opposed to just treating disease and damaged skin. Why would I need ZO Skin Health? The Daily Skincare Program provide essential tools to help achieve healthier skin using retinol, antioxidants to promote cellular function and restore and maintain youthful, healthy-looking skin.